With just four league fixtures left in the C Tarleton Hodgson sponsored ladies’ league, the position at the top of the table is by no means decided. At the moment Port St Mary have a lead of 65 points, while a disappointing week for South Ramsey means that Castletown have overtaken them for second place and Nobles are edging ever closer to the top three. South Ramsey were unfortunately a player short in a low scoring match against Nobles although Jenny Moore and Gill Dixon both won to single figures, as did Sylvia Kennaugh for the home side. Marown had three winners at Castletown, and, apart from a stellar performance from Heike Perry, made the Castletown players work hard for five of their wins. Peel Sunset were unable to match the exploits of their over 60’s team earlier in the week but fought well to take four games. Good wins to single figures by Val Macfarlane and Ann Maddrell gave the league leaders the advantage on points. Top scorers of the night were Port Erin, who won 7-2 on games with three wins to single figures. The two winners for Mooragh Park were Caroline Parker, to single figures and Vicky Lloyd-West who edged out Carol Kaye 21-20..Purt le Moirrey were not far behind winning 6-3 with three wins to single figures, Douglas had the better of Onchan 5-4 with two wins to single figures. Onchan also had two wins to single figures, but the game of the night saw Sue Gawne come through 21-20 against Muriel Cain. The two games postponed from June 23 due to the Super 32 event at South Ramsey were played on Wednesday 26 July. The matches played that night were all interrupted by a short, but very intense hailstorm, but despite players coming off the green during the worst of the weather, play resumed and all matches were completed. Nobles travelled to Port Erin where, apart from Caroline Whitehead’s win to single figures, the games were close with three going all the way, Carol Kaye for the home side just losing out 20-21 to Lin Ruscoe while in reply Viv Cook reached 20 against Phil Dobson and Debbie Leece reached the same score against Mavis Franks. Douglas could only register two wins at South Ramsey courtesy of Harley Garrett and Paula Garrett who won to single figures. Brenda Williams came closest to adding a third game, reaching 19 against Fiona Kennish. Port St Mary won 6-3 on games in their match at Marown, the three winners for the home side being Lil Smith, to single figures, Philippa Taylor and Shirley Whelan who edged out Katy Williams 21-20.Peel came off second best in a low scoring match at Purt le Moirrey, despite winning 5-4 on games, as the home side won three of their four games to single figures. 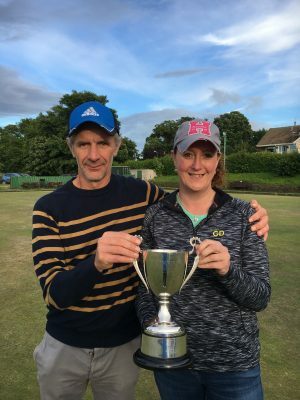 South Ramsey Bowling Club hosted the Kennish Cup mixed doubles competition on Sunday afternoon with 27 pairs taking part, with the Kennish family running the competition in favour of local charity Hospice Isle of Man. In what must surely be a record for an open competition on the Isle of Man £1,200 was raised for this worthy cause. The eventual winners were last years winners Gill Dixon and Dido Kelly defeating club mates Jenny Moore and James Teare 21-6 in the final, with the score not reflecting the standard of play. Gill and Dido got through their semi-final with a comfortable victory over the Southern duo of Tracy Moore and Wayne Roberts. In the other semi-final Jenny and James ended the challenge of club mates Elaine Moore and Glynn Hargraves. Losing out at the quarter-final stage were Lyn Bolton and Trevor Quayle (South Ramsey/Port St Mary) Bethany Kennish and Steven Waters (South Ramsey), Lorraine and James Moore (South Ramsey), Diana White and David Thomson (North Ramsey). At the conclusion of play the presentation was made by Elaine Moore on behalf of the Kennish family and Alan Moore, who thanked everyone for their generous donations, the Ladies for the excellent refreshments, and everyone who helped throughout the day. Anyone who would still like to donate please contact Chas Grills or Alan Moore. 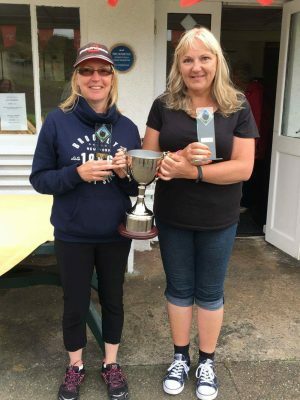 There was an entry of 19 pairs for the ladies’ doubles at Peel on Saturday 29 July, sponsored by Ballapaws boarding kennels. The fine weather added to the occasion, and with the green running well, but not too fast, it was an afternoon of good bowls played in friendly fashion. Quarter-finals: Lyn Bolton and Paula Garrett 21, Elaine Moore and Gill Dixon 15; Ann Hollingworth and Heike Perry 21, Debbie Leece and Alison Keggen 15; Sue Jones and Joyce Kelly 21, Ange Maddrell-Reeve and Jan West 16; Lynda Cadamy and Philippa Taylor 21, Margaret Tasker and Tricia Bull 13. The semi-finals were well-fought and perhaps a little closer than the scores might suggest. Semi-finals: Lyn Bolton and Paula Garrett 21, Ann Hollingworth and Heike Perry 14; Lynda Cadamy and Philippa Taylor 21, Sue Jones and Joyce Kelly 15. The final started in cagey fashion with honours shared over the first ten ends, at which point the scores were level at 12-12. However at this point Lyn and Paula refused to let Philippa and Lynda have another turn of the jack, coming through to win 21-12. Club president, Heather Horsburgh, thanked all those who had entered, and those who had helped with the smooth running of the afternoon, before introducing Chris Owen, of Ballapaws Boarding Kennels, who had generously sponsored the event and provided the new trophy, to present the prizes. Port Erin celebrated the fine weather on Tuesday 25 July in the Trend sponsored over 60’s league wit a maximum against Mooragh Park, winning four games to single figures. Anne Kean fought well to reach 19 against Voirrey Curphey, while Moira Anderson came even closer to giving the visitors a game as she lost out 20-21 to Jackie Elliott. Ballaugh seem to be making a habit of close matches, this time coming through by one point against Onchan. There were some close games with Brenda Bowyer reaching 19 against Libby Andrade, and Rita Callan getting even closer in her game with Maureen Trustham. Nobles struggled at Marown winning just two games courtesy of Lin Ruscoe and Pat Dacre to single figures. Marown won three of their four games to single figures and took the match by 30 points. Port St Mary B had a good win against Castletown, the two winners for the away side being Ann Hollingworth to single figures and Sue Peach who came through 21-19 against Dot Mylchreest. It was 4-2 in the home team’s favour at Villa as they played host to Breagle and won by a margin of 13 points. Last, but not least, was the top of the table clash which saw Port St Mary A travel to Peel Sunset to find their opposition in top form. Rita Callister spoiled the party for the home side (which is not fair after all the nice write-ups I have given her recently), winning her game to deny the westerners a full house. With four of their players winning to single figures, the margin of victory may show that all is not yet decided in this league ! It was local derby day at Port St Mary, as the B team travelled to take on the A team. Brenda Hawkard spoiled the party for the league leaders, winning her game to deny them a full house. Casletown played host to Marown, winning five games, two to single figures, with Mary Alderson being the lone winner for the visitors. Jean Quine was the fly in the ointment for Peel Sunset, denying them a maximum as she won her game to single figures. Wendy McDowell almost gave Onchan a second game, reaching 19 against Mary Moffatt. Mooragh Park are continuing to improve, drawing on games with Ballaugh, Peggy Griffin‘s win to single figures giving the visitors the advantage on points. Douglas won 4-2 on games, but good wins to single figures by Mavis Franks and Jackie Elliott gave Port Erin a 20 point win. The two winners for Nobles at Villa were Lin Ruscoe, to single figures, and .Viv Cook, while Muriel Cain also won to single figures for Villa. Atrocious weather on Friday 21st July saw the cancellation of two matches while the rest were playing under very trying conditions with Greens holding quite a lot of water. Ballaugh B hosted Port Erin and on a very wet day the Southerners put a lttle sunshine into their lives by taking a 6-2 victory with Bobby Clayton and Peter Corlett being the winners for Ballaugh. At the Villa Douglas B lost 7-1 to Nobles A with Douglas player Les Quayle getting his first win with a 21-19 victory over Joe Bullock. Douglas A travelled to play Port St Mary A on a Green that was only just playable and the men from the South won 7-1 although this could have been much closer with both Stuey Garrett and Tommy Rougvie only losing 21-20 and Keith Fearnley 21-18. The winner for Douglas was Keith Rise who inflicted a 21-11 defeat on individual merit leader Chris Oates, this being the first loss of the season for Chris. Marown had a 5-3 win at home against Onchan B although Moore Kelly had a great battle with Ian Kissack to only lose out 21-20. Nobles B and Finch Hill battled to a 4-4 draw while in the Mooragh Park North Ramsey B had a good 7-1 win over Port St Mary B with Bob Talbot being the only winner for the ‘Port’. Onchan A struggling to keep up their push for the League entertained Castletown B and in what seemed a very close encounter the result was a very fitting draw. Peel Sunset C entertained North Ramsey A with the Northerners taking a 7-1 win with Ray Hardman being the only winner for Peel beating Brian Colquitt 21-15. Tuesday 25th July saw Douglas B travelling to play league leaders Castletown A with the team at the top taking a 7-1 win and back in Douglas the Douglas A Team had a 5-3 victory over Castletown B. North Ramsey A had a 6-2 win over Finch Hill while the North Ramsey B side travelled to Marown where they lost 7-1. Peel Sunset A had a great 8-0 home win over Port St Mary B and in the reverse fixture Port St Mary A made things even by beating Peel Sunset B 8-0. Nobles A took a 5-3 win after their travels to Ballaugh A and Nobles B played to a 7-1 win over Ballaugh B at Nobles Park. Finally Onchan B entertained Port Erin that resulted in a 6-2 win for the men from Onchan Park. So after these matches were played we see Castletown A still at the top with 46 points followed by Peel Sunset A and Port St Mary A on 42 points and Onchan A on 41 points. The wet weather on Friday 21 July meant that two games had to be postponed in the C Tarleton Hodgson sponsored ladies’ league. Despite the miserable conditions Port Erin found their journey north to Douglas to be well worthwhile, winning 8 of the 9 games, five of them to single figures. The lone winner for the home side was Brenda Williams, although Pat Kelly nearly added a second game, reaching 20 against Carol Kaye. Castletown travelled even further north and struggled at South Ramsey, winning just three games, Hannah Drewett to single figures, while the home side won three of their six games to single figures. There was a ding-dong battle between Fiona Kennish and Ann Hollingworth, with Fiona just coming through 21-20.Nobles also won 6-3 on games, four of the wins being to single figures while the three winners for the home side were Maureen Lacey, Julie Reilly and Diana White. Things were more evenly matched at Ballaugh where the home side led 5-4 on games with Brenda Bowyer and Alison Millard winning to single figures as did Jo Smith for the visitors. 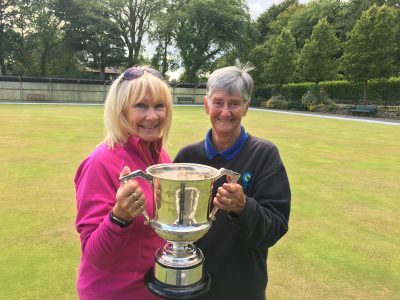 Kay Primrose-Smith spoiled the party for Port St Mary B in the Trend sponsored over 60’s ladies’ league on Tuesday 18 July, coming through 21-20 against Chris Holland to leave the home side just one point short of a maximum. Steff Swift came closest to giving Breagle another game, reaching 18 against Dot Mylchreest. The games were shared at Peel Sunset, but with all six players on the home side scoring 17 points or more, and Joyce Kelly winning to single figures, they ended with a comfortable points advantage over Nobles. Matches don’t come much closer than they did at Ballaugh, when visitors Castletown fell one point short of their hosts, despite winning 4-2 on games, in a high scoring game where all twelve players reached double figures. Douglas and Onchan also shared the games, 3-3, but a win to single figures by Lynda Clarke gave the visitors the advantage on points. Marown had the better of Villa 4-2 on games, but with Muriel Cain winning to single figures and everyone on the away team reaching double figures the difference was only 14 points. Port St Mary A travelled to Port Erin where they won 4-2 on games with Margaret Tasker winning to single figures, the two winners for the home side being Jean Thackrah and Sylvia Shelbourne. Douglas recorded a maximum on Thursday 20 July when they journeyed north to Mooragh Park. Sue Caley and Brenda Williams both won to single figures, but the improvement in the home players was evident in the resistance they showed. Port St Mary A were denied a full house by Brenda Bowyer with Peggy Griffin almost adding a second game for Ballaugh as she just lost out 19-21 to Kath Looney. Port St Mary B’s good week continued when they visited Nobles. Despite winning only two games, their two winners, Edwina Reid and Roma Ware, both won to single figures while their other players all reached double figures, to give them victory by 10 points. It was a high scoring game at Onchan, with all twelve players reaching double figures. The home side had the advantage on games, 4-2, and finished with a twenty point lead. Mary Alderson and Shirley Whelan both won to single figures when Marown visited Breagle whose two winners were Kay Primrose- Smith and Jennie Cain. Peel Sunset had a successful trip to Castletown, although the games were shared the visitors all reached at least the 15 point mark, while good wins by Cath Parker, to single figures, and Joyce Kelly gave the visitors the advantage on points. In week 15 of the Ellan Vannin Fuels sponsored league, South Ramsey visited the Sunset City last Monday evening and were asked a few serious questions by Darren Young’s progressive Peel A, David Bradford stole the show and played superbly to defeat the Peel captain 21-3 but throughout the evening the champions were definitely not having it all their own way. In the first four games South Ramsey suffered two loses with David Proctor beating Glynn Hargraves 21-18 and Frank Watson coming off 21-15 against Chas Grills, not really an early birthday present for Chas who celebrated his 70th birthday the following day, with two wins each at the half-way stage the game was in the balance, but in the second half the away side had the better of things but most games were closely fought, Peel A managed one more point Barney Kelly defeating John kennish 21-20 with a devastating final bowl, a high quality match and a fair result. Marown A were on their free week which gave Onchan A the chance to put pressure on the second placed team, Onchan did exactly that with a 10-0 win away against Port Erin A, the win puts Onchan A back up to second place but relegated Port Erin to the bottom of the league at the close of the evenings play.
. Port St Mary A had a 10-0 home win over Ballaugh A with Trevor Quayle still remaining unbeaten this season, the result moves Port St Mary back up to fourth spot. Castletown B inflicted a 6-4 defeat on Douglas A, a great performance which included a 21-9 win for Dave Faragher over Merv Sayle. Douglas B held Castletown A to a 5-5 draw winning five of the eight games but losing out on the aggregate by three points. South Ramsey B enjoyed a 7-3 home win over their local rival North Ramsey A giving them temporary bragging rights. Leaders Marown B were at home to Port Erin B and had a solid 6-4 win which leaves them two points clear at the top, second placed Onchan B suffered a 6-4 home defeat to Noble’s A.
Finch Hill A beat Port St Mary C 7-3 which a included 21-5 for Billy Long and a 21-6 win for Arthur Halsall. Noble’s B had a 8-2 win over Douglas c and now are just three points of second place, Port St Mary B had a good home win over Peel 8-2 and Onchan C defeated North Ramsey B 7-3 with Brian Woodall recording a 21-4 win. The division leaders Peel C were away to South Ramsey D came away with a great 9-1 win with Paul Baker and Jeff Wilson winning to single figures they are now seven points clear with the club benefiting from the effort put in to encouraging new players to the game. Peel D also had a fine victory defeating Marown C 7-3. Ballaugh C hosted South Ramsey C and enjoyed 6-4 win and leaves them looking in a good third spot. Castletown C had much the better of home game against Nobles C winning 8-2 and a 36 points aggregate margin, Ballaugh B travelled to Douglas D and left with seven points for their efforts. With an excellent entry of 30 the Heywood Gelling Mixed Doubles was played at Marown, with the weather set good for the day. With 7 of the games going to 21-20 there was some excellent bowling all round with the eventual winners being South Ramsey duo of Elaine Moore and Glynn Hargraves beating IOM Mens President Clare Cooper and Lee Dawson 21-15. The semi-finals were both one sided affairs both games ending 21-7 Elaine and Glynn beat Fiona Kennish and Stefan Kelly and Clare and Lee beating Matthew and Alison Keggen. Fallers at the quarter finals were Jordan Cain and Paula Firth, Phil Kelly and Pat Withers, Chris Price and Wayne Roberts and lastly Alan Moore and Kim Hargraves. Colin Kelly presented the prizes to the winners with the competition finishing at 7.10 p.m. This years Jordan Cup was played as a doubles in a round-robin format with a draw for partners. This elicited an entry of thirty-two, making sixteen pairs who were then split into four groups. Each group was played as a round-robin with games being played to nine ends, the four group winners progressing to the semi-finals. Group A: Lin Ruscoe and Lynda Cadamy were the clear winners on 38 points, the other three pairs all tying on 20 points. Group B: Lyn Bolton and Kellie Maddrell-Reeve won with 27 points, while Joyce Kelly and Sue Caley were second on 21 points. Group C: Winners were Paula Garrett and Lynda Wilson on 28 points, runners-up Vicky Lloyd-West and Paula Firth with 25 points. Group D: Chris Price and Rita Callister progressed with 26 points ahead of Debbie Leece and Lil Smith on 22. The semi-finals were also played to nine ends and saw Lin Ruscoe and Lynda Cadamy overcome Paula Garrett and Lynda Wilson 8-4, while, cementing her recent reputation as a doubles player, Rita Callister accompanied by Chris Price saw off Lyn Bolton and Kellie Maddrell-Reeve 9-3. The final, played to eleven ends, started with two singles from Lin and Lynda, followed by a two from Chris and Rita , making the score level at 2-2 after three ends. From that point Lin and Lynda were always ahead, without getting away from their opponents, the score after ten ends being 8-6 in their favour, leaving Chris and Rita a chance to come through. However a three gave Lin and Lynda a final winning score of 11-6. Joyce Ogden, who had run the sheet throughout the afternoon thanked all those who had entered and those who had helped ,both round the green and in the kitchen, to make the afternoon a success. She then introduced Club Chairman, Clare Cooper, to make the presentation.